Maggie Lamond Simone did not start out her adult life in the best of ways. Alcohol was the norm until the day she wrecked her car and asked the officer on the scene to drive her to the local bar she was headed to, instead of her home. Amazingly something clicked in her mind and she sobered up the next day, starting a new life as a bit more of a “responsible” adult and even managed to begin a writing career. From Beer to Maternity is a collection of some of her columns that chronicle Ms. Simone's adventures in dating, marriage, pregnancy, motherhood and menopause with an exceptional mix of no holds barred, gritty humor emphasizing that mistakes happen, but you can get over it, move on, and even laugh about it in the process. Although the author freely speaks about her addiction to alcohol, this book is definitely not your average tragic addict-to-heroine type of recovery book. Instead, this story presents a comically entertaining look into the author's not-so-perfect life, and at the same time, it boldly provides useful, frank advice on a few key life events through the eyes of one who has been in the trenches and has managed to not only survive but come out laughing in the end. From Beer To Maternity is even set up in fairly concise sections that often include candid bits of advice perfect for the busy woman facing similar life challenges. For instance, “You know you're getting old when...” that mentions “You catch yourself doing something your parents did and breathe a sentimental sigh, instead of screaming 'AAAAAHHHHHHH' like you would have a few years ago.” and “The Cookie Theory...” which states that cookies eaten at night, in the car and your child's leftover cookies, all have no calories. 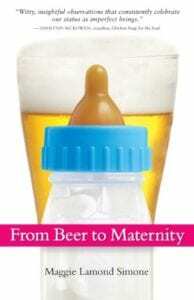 From Beer To Maternity is an exemplary, hilarious read that will not only make readers chuckle, but they may find themselves sniffling a bit, nodding their heads vigorously in agreement, and is a must-read for everyone, even if you haven't yet experienced all the craziness that life has in store for you. Quill says: If you're in the mood for a hearty laugh that pokes fun at real life, and even gives some good advice, this book is for you!